Chris Achilléos is a Cypriot-born British artist who came to prominence in the 1970s and ‘80s with illustrations for a large number of books and magazines in the Fantasy and Sword ‘n’ Sorcery genres. Instantly recognisable for his exquisitely rendered female figures, invariably beautiful, frequently belligerent, he became widely known amongst fans through several best-selling art-collections that remain popular to the present day. His obvious delight in painting muscular, female warriors who stared defiantly from the covers of countless publications contrasted at the time with the willowy, weak-limbed princesses favoured by many of his contemporaries. 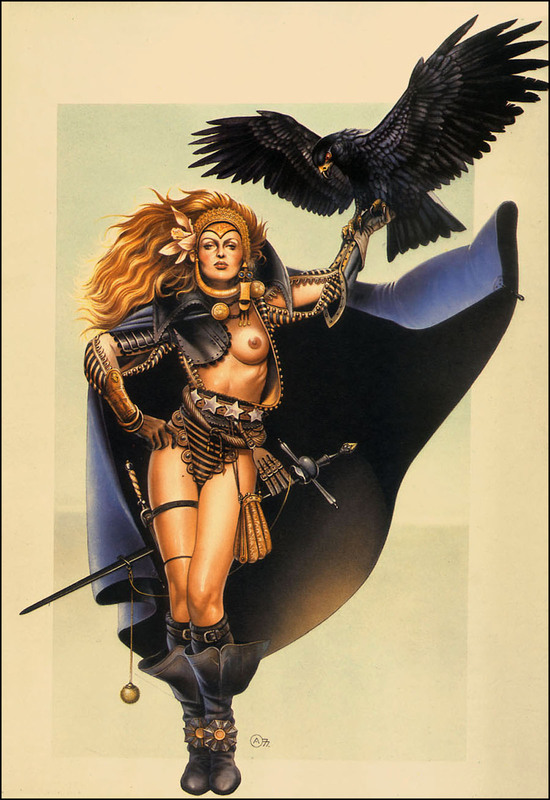 Aside from the stunning and much-loved “Elven Warrior”, a 1983 wrap-around jacket for Michael Moorcock’s seminal high fantasy work “Elric at the End of Time”, his most famous artistic production is “Raven, Swordmistress of Chaos” drawn for the cover of a 1978 book of the same name by Richard Kirk (the shared nom de plume of the authors Robert Holdstock and Angus Wells). However in this particular case the fame came incidentally through the Irish-British musician Kate Bush who along with the designer Pamela Keat chose the illustration as a source of inspiration for the costume she wore in the music video of her 1980 hit “Babooshka”. For a gallery of more magnificent artworks by Chris Achilléos please visit here.